If you’ve ever had to work in an IT shop bound by regulations and policies, you know how much of a hassle it can be to integrate new infrastructure and application components, while maintaining a compliant posture. You may have some applications bound to a NIST policy, some to HIPAA, and others may follow a custom policy your local security officer mandated. With so many regulations, you need a way to enforce compliance, based on multiple environmental factors. Additionally, you want to know your code is compliant before deployment. 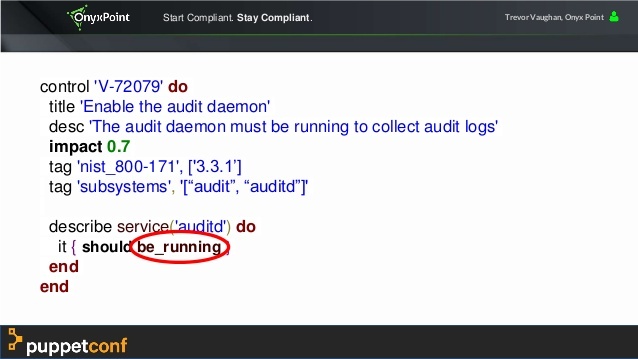 You find yourself asking, how can I enforce compliance and know I’m compliant on live systems? The SIMP team is proud to provide an answer to that question. We have developed an end-to-end solution for automated system compliance and reporting, made possible with two key developments - compliance parameter enforcement with the SIMP Compliance Engine, and automated framework testing with Inspec. The full announcement was made at PuppetConf 2017. Some of you may be familiar with the old version of the system, the compliance_markup puppet module. In the past, it served solely as a report generator that mapped Puppet parameters to compliant system values, per NIST, DISA, HIPAA, etc. It would provide users with a .json report, summarizing non-compliant parameters, and recommending their compliant counterparts. 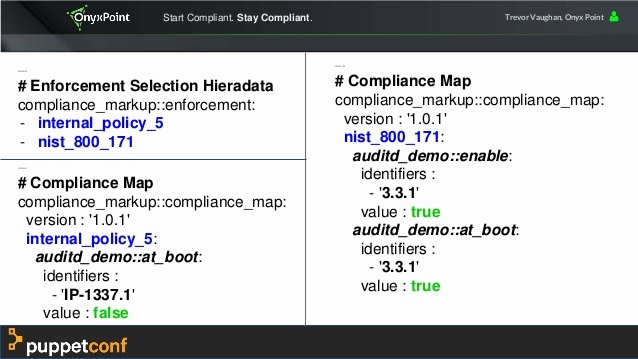 Now, the Compliance Engine has the ability to enforce compliant parameters. Like before, users specify a list of compliance profiles, to best suit their site security needs. But now, every puppet run, the Compliance Engine can set the parameters passed to classes on a node to the compliant values defined in the profile. 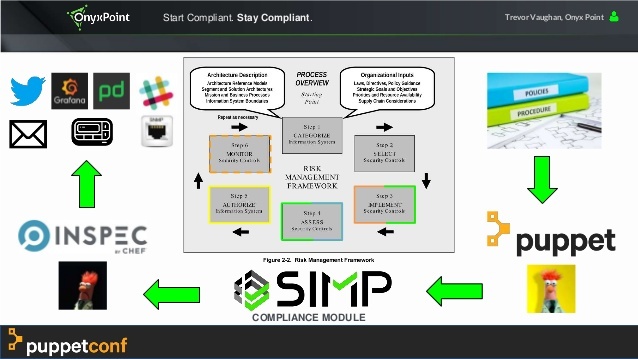 Out of the box, SIMP Community Edition ships with support for NIST 800-53 and the DISA STIG, but the profile framework is extensible, and the Enterprise Edition comes bundled with more compliance profiles. Inspec is a platform-agnostic tool, built on rspec, used to check live systems for policy compliance. Its unique features allow developers to map custom checks on the system directly to policy. Developers can also assign an impact rating for each check. We have built the beginning of a STIG profile to supplement the Scap Security Guide, and have written custom helpers to run the profiles(s) automatically, as part of an acceptance testing suite. 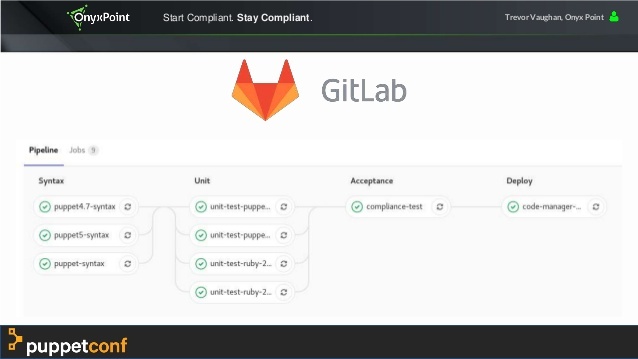 That means developers can work compliance tests into their release pipeline, to ensure their code is compliant before deployment. SIMP currently supports Beaker and Kitchen.ci as testing backends. So how do these technologies fit into your workflow to achieve end-to-end compliance? From a risk management perspective, Puppet and the Compliance Engine select and implement security controls, while Inspec assesses security controls. The diagram below illustrates the entire process.